MEET WITH THE PRINCE... UGLY, HUH? I started my primary education at Iganmode Nursery and Primary School Sango-Ota after which I went to Omolabake Nursery and Primary School, also in Sango-Ota, Ogun state where I received awards such as the award for being ‘the most well-behaved pupil, when I was in primary three and the award for being ‘the best pupil in quiz competition, when I was in primary five. I also received an award for taking the first position in the 100m boys race. 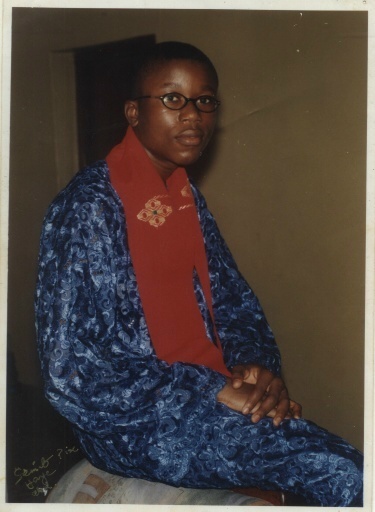 After my primary education, I proceeded to the secondary school for my secondary education. The secondary schools I attended includes:An-sar-ud-deen Comprehensive College, Sango-Ota (hey, did you say a muslim school? Well, I was a Christian and I'm still a Christian), Salawu Abiola Comprehensive High School, Osiele, Abeokuta and Macjob Grammar School, Onikolobo, Abeokuta where I was the Senior Prefect between October 2002 and May 2003 and also received an award for being, the best student in English Language. Although I've always been a sucker for technology, which explains why I want to be a computer engineer, I also have a penchant for surfing the internet as a result of which I've been nicknamed "webmaster" by some of my friends; it was during one of my exploration of the internet that I came across "tripod" which now hosts my "personal site" So, I've been thinking; maybe I should become a real webmaster in addition to being a computer engineer, and start developing websites for individuals and organizations as well as allowing individuals/organizations place advertisements on my websites which will not cost them much; since it's just something I enjoy doing; I'm putting up a site that will be focused on these...(http://couriernet.tripod.com) So, if you're interested in any of my services, send an e-mail to web.master@soyoye.zzn.com or webmaster@couriermail.zzn.com. The first twenty clients get a discount of 20% while subscribers to any of the e-mail sites mentioned above gets a discount of 25%. You can as well tell your friends about these services and if they become my client, you will be given 10% of their payment as soon as they have fully paid; just tell them to mention your name in their letter to me. Hey! Did you again say that I've been wittering about my services? Well, that was important. Now, back to my description about myself.